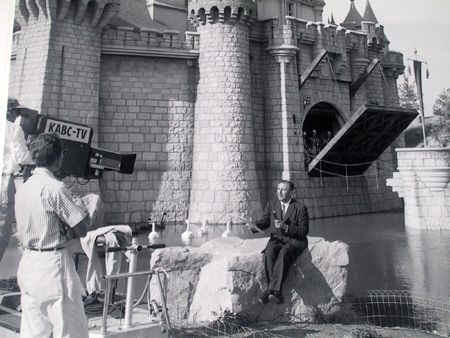 This picture was taken during the opening broadcast of Disneyland. Seen over ABC-TV on Sunday July 17th 1955 7:30-9:00 p.m. EDT. Notice the draw bridge in a very rare open position. The cars stretched bumper-to-bumper for seven miles on the Santa Ana Freeway in what police at the time called, “the worst traffic jam ever seen.” The date was July 17, 1955, and the contingent of first-day invitees was on its way to Anaheim where Walt Disney, known for his creative genius in the motion picture industry, was about to unveil a new entertainment experience: his personal dream, DISNEYLAND”. Tickets for the invitational opening day event had been given to Studio workers, those who had constructed the Park, and to press, dignitaries and celebrities. But as the gates opened a year after groundbreaking on the 160-acre orange grove, all was not quite ready. Nearly 30,000 invited guests, along with countless people holding counterfeit tickets, poured through the gates to create long lines everywhere. Rides broke down shortly after opening and restaurants and refreshment stands ran out of food and drink. Fantasyland had to be temporarily closed due to a gas leak, workmen were still planting trees and in some areas paint was wet to the touch. The blistering heat of the July day added to the distress as the spiked heels on women”s shoes sank into the soft asphalt on Main Street. Yet, Walt Disney was unaware of the chaotic situation. He was being shuttled from one part of the Park to another for a live 90-minute television broadcast, “Dateline Disneyland,” showcasing his newly unveiled creation. Led by co-hosts Bob Cummings, Art Linkletter and a man destined to become President of the United States, Ronald Reagan, 90 million viewers witnessed the fantastic result of one man”s dream come true. And changes there were. Walt immediately summoned his staff, and together they dealt with the problems of low ride capacity, congested walkways, traffic jams and slow food service. Walt spent his days and nights at DISNEYLAND — observing guests, ride operators, food servers, merchandise and custodial Hosts/Hostesses. He continually asked questions in a relentless search to improve what was to become the most successful venture of his accomplished career. After only seven weeks of operations, DISNEYLAND welcomed its one-millionth guest and at the close of its first fiscal year, 3.8 million visitors had been hosted. Today, more than four decades later, DISNEYLAND park”s success is world-renowned. A land of fantasy and enchantment, it continues to entertain and delight children of all ages, unique in the world of family entertainment. On July 17, 1955, the financial investment was $17 million and 18 attractions were showcased. Today over 60 attractions exist, and since opening, DISNEYLAND has welcomed more than 300 million guests. Walt Disney”s words are as true today as they were then, and they will be true for many years to come.